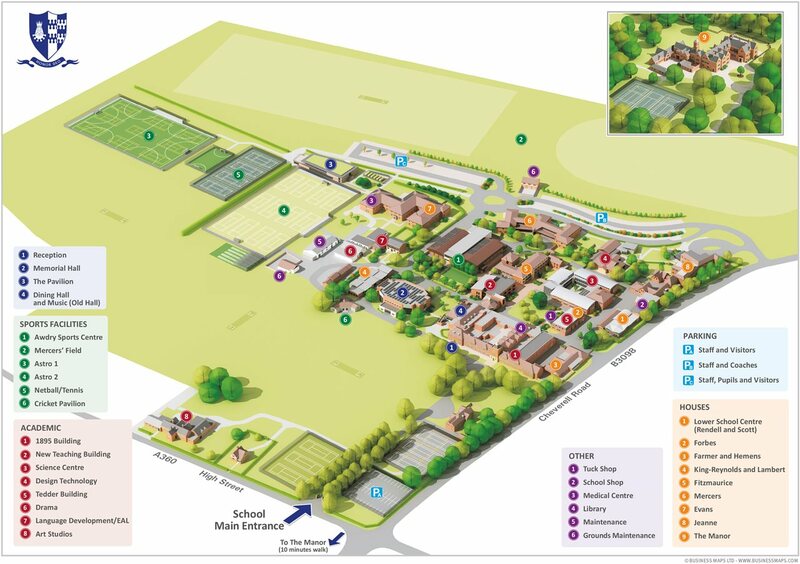 The School is set in an estate of more than 150 acres, in the picturesque Vale of Pewsey, five miles south of the historic market town of Devizes. There is easy access by road, with Bath, Salisbury, Swindon and junction 17 of the M4 within about 40 minutes; Stonehenge lies a few miles south on the A303. The centre of London is less than 100 miles away. Nearby stations at Westbury, Pewsey and Chippenham are served by InterCity express trains from London Paddington. The Rail-Air link to/from Reading Station provides connections with Heathrow and Gatwick Airports. Approaching from the north, northwest take the M4 to exit 17 and follow the A350 to Chippenham, then take the A4 (towards Calne) and leave theA4 at Devizes taking the A342 and then the A360 (sign-posted to Salisbury) to West Lavington. From Swindon take the A346 to Marlborough and then travel west on the A4 to the Beckhampton roundabout. Take the A361 to Devizes and then join the A360 (signposted to Salisbury) to West Lavington. From the east and northeast, travel west along the M4 to Junction 14, take the A4 at Hungerford and continue west through Marlborough to the Beckhampton roundabout. Take the A361 to Devizes and then join the A360 (signposted to Salisbury) to West Lavington. From the south and southwest, the best routes are either from the A303, turning off at Mere onto the A350 through Warminster, or through Frome on the A361. In both cases the routes take you through Westbury, from where you should take the B3098 road through Bratton and Erlestoke to West Lavington. From Salisbury, take the A360 (sign-posted to Devizes) to West Lavington. From Bath take the A4 and turn right before Box onto the A365 and then the A361 to Devizes, and take the A360 (sign-posted to Salisbury) to West Lavington. Please note that the main entrance and visitors' parking is from the main A360 in the village and not the side entrance on the Cheverell Road as marked by some routefinder providers. The nearest railway stations are Westbury (8 miles) and Pewsey (11 miles). Heathrow is two hours away by road. Gatwick is two and a half hours away. Bristol and Southampton Airports are also an option. Please do come and see Dauntsey's for yourself; we will be delighted to welcome you. Open mornings are held each year in the spring and autumn and small group tours are held regularly throughout the year.